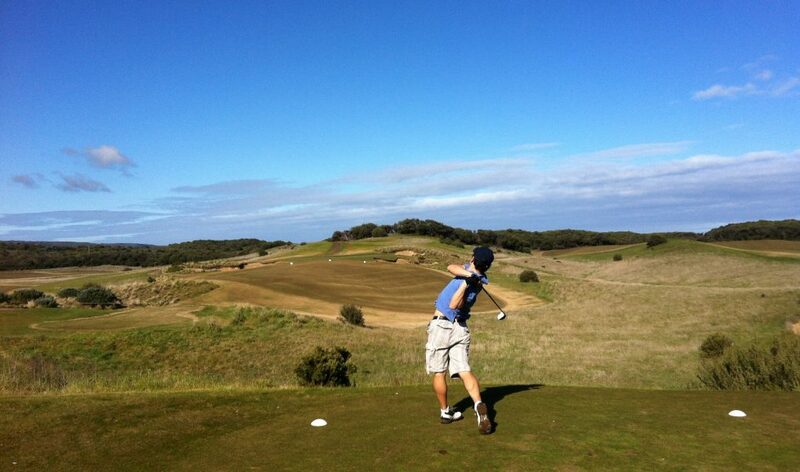 The first ever Bash’n’Dash was played over 18 holes at Barnbougle in the Winter of 2012. The Committee initially considered 18 holes + a number of novelty holes (opposite handed, blindfolded, kick and a throw etc) but ruled that out as too whimsical. Bridport turned it on with a cracker of a day, but who would bring the golf fireworks? Summary: Basil controlled proceedings right from the start with some great drives and clutch short game. There were pars aplenty for Mr van Riet, but not so much from the others. From about halfway it was looking unlikely that anyone would challenge, and that was the way it went with Bas easing to the line to claim a comfy win by 6 or 7 shots. After a couple of crisp beers in the clubhouse, Felix and the two Leighs went out for another 9 because they were loving the course so much and Bas went for a lazy walk on the beach to contemplate his first win. Ahhhh… what a feeling! Basil finally set aside the bridesmaid tag and triumphed in a Major. Finally some justice for the best golfer in The Gentlemen’s Social Golfing Club! Results: Basil winner 34 stableford points, Cravo 2nd, the others just behind. Posted on May 8, 2017 July 4, 2017 by Gentlepersons' World Golf Tour, Tasmania	This entry was posted in golf and tagged barnbougle, majors, tasmania, world tour. Bookmark the permalink. ← 2016/17 Lost Bougle – A Close One!